Finally a pillow that helps me sleep without neck and shoulder pain. I have fibromyalgia and have searched for a pillow that helps me sleep on my side that isn't too stiff or too flat. I can also use it for reading in bed. Very happy with my purchase. 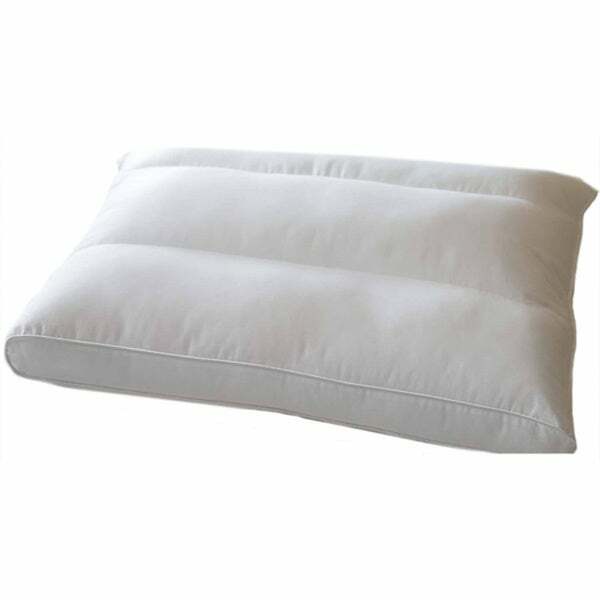 Select this pillow if you prefer to sleep on your side, as the knife edging on one side and gusseted edge on the other make this pillow perfect for this sleeping position. Its firm construction is ideal for those who require strong head support in order to attain a good night's rest. Best nights sleep I've had in a long time! My husband and I have been trying to find a decent pillow for a while now. His pillow is a brick and mine is a marshmallow. I purchased this one so we could try it out. We love it! I am ordering another one immediately. Not to hard and not to soft. It's just right. This pillow is amazing. I sleep so comfortably. It fits perfect with my other pilows. Weirdly I start on my side and end up on my tummy. This is the perfect start for restful sleep. I think I get one more for my boyfriend. This is an excellent pillow. I would highly recommend this to a friend, or anyone else who would ask me about its00 quality or durability. If you are a side sleeper, you will love this pillow. I like the way it supports, as I sleep on my side. This pillow is perfect!! Firm enough to support your head and soft enough to be comfortable. I've had back and neck trouble for years and had actually resorted to sleeping with one of my son's stuffed animals under my neck. No need to do that now! I wish I had brought this pillow years ago!!! I wanted a pillow I could tuck under my arm, my knees, and my lower back at different times of the night. This pillow does that and does not lose its shape. Bought this for my wife because she sleeps on her side and better with a pillow between her knees She says she is happier with this than one of our bed pillows. So, I am a side sleeper who ends up on her tummy every night. My bones grind and it feels like plates touching each other. This pillow sets me higher. Gives me neck support, and I am keeping it past the suggested six to twelve month replacement period. I will wash as suggested but not let it go to the sleepover pile! I ordered these two pillows for my grandson to take to college with him the end of this month to begin his Freshman year on a baseball scholarship. I had them shipped to him and he couldn't resist using them at home, "just to try them out". My daughter reports he has given her his old pillows to do "whatever" with. He Loves the pillows and because he is both a side and a back sleeper, he tells me he is sleeping much better with his two new pillow!!! Hope that will help him stay on the Dean's List at school and be the pitching ace on the baseball field!!! gets soft and lumpy during the night. I love this pillow. I don't wake up with a headache and it keeps its shape. LOVE IT!!! I can wash it and it does not lose its shape. Very happy with this purchase. I loved it a first. It was supportive of my neck when I laid on my side. However, it flattened and lost much of the support in a few months. Used to love this pillow but the one I just recently purchased seemed too firm and was not comfortable. Only gave 4 stars because I'm not quite use to it yet. I think I'm really going to like it once I sleep on it a while. This is the first pillow that I have found that was truly made for side sleepers. I no longer wake up with a sore neck. The quality of the pillow is well made. I’m impressed as I wasn’t expecting it to be so comfortable. "I use a full face Cpap and I'm a side sleeper. How this pillow do?" I am suffering from horrable headaches associated with the pillow I am using. Hopefully, this pillow will help aleviate my headaches. I had a great night sleep on this pillow when I received it last Thursday. I did not wake up to a headache nor tension in my neck. Been sleeping on it for a whole week. Very Happy with it. So I wanted to order another one for me and my roommate wants one. Need a good (Sealy makes good products) that isn't too expensive. Overstock is a good source for such things. -- Jill A. "What size pillow is this?" Hi sgriffen, this pillow is a standard size pillow at 20 inches wide by 26 inches long. I hope this helps, thank you for shopping with us.